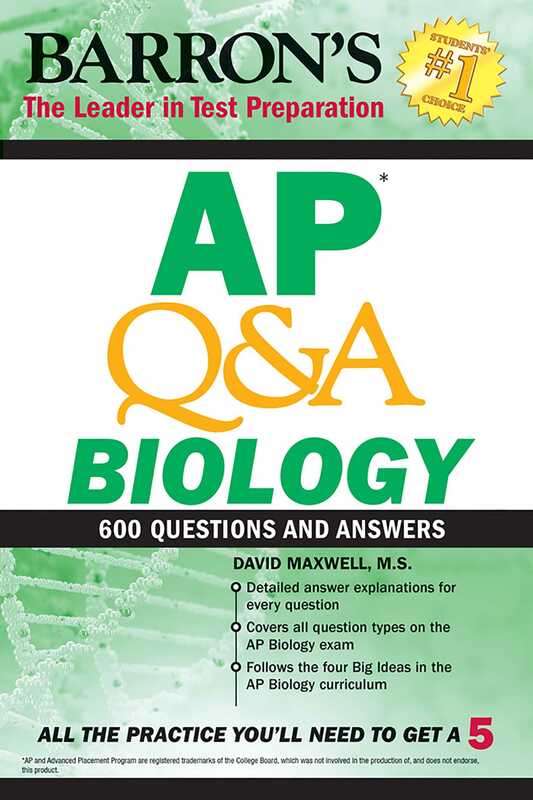 Barron’s new AP Q&A Biology features 600 questions and explanations covering all Big Ideas for AP Bio. Practice includes all exam question types so students can apply the skills they learn in class, and answer explanations help students review and understand the content. AP Q&A Biology doesn’t just explain why an answer is correct—students will learn the rationale behind why each other answer choice is incorrect, helping them understand the key concepts and how to apply them on exam day. Practice questions and comprehensive explanations follow the four Big Ideas in the AP Biology curriculum including Evolution, Energy, Information, and Interactions topics. AP Q&A Biology is specifically created to help students hone critical thinking skills and practice with all AP-style question types, such as multiple-choice, numeric response, and short and long free-response questions. Looking for in-depth content review along with realistic practice tests? Try Barron's AP Biology for even more prep. More books from this author: David Maxwell M.S.